Last year, I asked some blog pals and favorite bloggers to each share one item that they'd especially love to find under the tree. I then compiled their picks into one big blogger holiday wish list that I shared here at Bubby & Bean. It was a lot of fun to put together (and gave me some great gift ideas! ), so I decided to do it again this year. Some of these bloggers run lifestyle blogs, some fashion blogs, some design blogs. Some I've had the pleasure of hanging out with in person this year, and some are internet friends. But they've each got a fantastic sense of style, and the goodies they've chosen would all make amazing gifts for those of you who are holiday shopping (as well as excellent ideas for your own wish lists!). "Here's my choice: The Mila French Vintage Leather Satchel from bOmode!" "We are both really into rugs right now (we are in house decorating mode). So our item is the Snow Peak Rug." "I'm looking for anything cozy to keep me warm this winter in Michigan. This pair of mittens would be perfect for a day of ice-skating at Rosa Parks Circle!" "Leif Shop's No. 102 Bracelet is on the top of my wish list. I'm drawn to the combination of odd shapes and contrasting colors. It's quite a beauty!" "We just moved into a new place, and it has a lot more wall space than our last place, so I've been compiling a wish list of art to put on the walls! I absolutely love this pretty, simple print! I imagine it going perfectly, framed along with the other prints I have." "I wish Santa would bring me an Ardium Smartphone Wallet. I don't even have a smartphone but I would totally buy one just for this adorable wallet! I can't stop looking at it." "I'm head over heels in love with pin-up style dresses and novelty print items. The two together? Heaven! I'd love to build a collection of these 50's era styles with the modern twists! I've had my heart set on this dress (and so many others!)." "I'm currently in the process of re-styling our home. And these round pin-tuck pillows from Urban Outfitters couldn't be more perfect. I love their fun and retro vibe and they come in a ton of colors too! They're definitely on my Christmas list!" "I have been coveting this camera for as long as I can remember, and I keep dreaming about how beautiful the pictures would turn out. I love cameras, so I am pretty sure I need to switch it up every few years; this one is my ultimate Christmas present." "The item at the top of my wishlist is a Keurig! I love flavored coffee, but my boyfriend doesn't. This way we could each have what we want!" "I'm a sucker for a certain style of vintage handbag, but they're often too small to accommodate my camera. I love the classic styling and practicality of this camera bag from ONA. The roomy size means I wouldn't have to carry a purse and an ugly grocery tote for my camera when I'm out and about!" "I've been a Disneyland fan for years, and I appreciate all things retro Disney, so this phone case was something that would be perfect. A pink vintage Disneyland ticket? I never really thought phone cases represented a person, but if they did, this would be it!" Beca: "I love tote bags and this one is moody and dark, just like winter nights in Tennessee. Perfect for a trip to the farmers market, or the coffee shop. It's extra large too, and for me, the bigger the bag the better!" Maggie: "I like suspended plants because they make you feel like your sitting under a canopy of trees, even though you're staying warm during cold winter days in your own house!" "My husband and I took a trip to Turkey in September and came back with some amazing loose leaf teas and no way to prepare them. For that reason I'd love to receive a Tea For One Brewing Set from Poketo, but times two (red for me and white for him)." It's been at least 15 years since I've owned a watch, and I'm thinking it's time (get it? get it?) that I put one back on my wrist. This La Mer Triple Wrap Watch in black would be perfect - it's simple, looks like a bracelet, and for a watch, is quite affordable. I know I've said this before (several times), but over the past couple of years I've discovered that the blogging community can be a pretty awesome place. I was never a blog reader before I started Bubby & Bean, so it's been a surprisingly wonderful experience to continuously come across rad new blogs and to get to connect with other bloggers. If you're ever in need of inspiration and you're not already a reader of the blogs that participated in this wish list roundup, I highly recommend checking them out. Each one has something terrific to offer, and they're all among my favorites on the web. What's the #1 item on your holiday wish list this year? Duni via EBT and new follower! Oh I love love love the pinup dress! So fabulous! Isn't it fun to curate in this way? You chose some righteous things...thanks for sharing! I love that you asked so many lovely bloggers! You have the best gift guide! Love this list and what a wonderful idea. I'm with you Melissa, was never a blog eader before I started www.notesfromtheslife.com. I have found that the blogging community is such a wonderful place filled with people that just want to get to know you and find their own little space in the blog world. I'm glad I came across yours! I love these blogger gift guides. I'll have one of everything please! Thanks for having me Melissa! I've been eying those pin tuck pillows from Urban for a while now too! Yay! It looks awesome, and gives me lots more things to put on my wishlist...haha. I'll go ahead and let Doug thank you personally for that! <3 but really, such a fun list and glad to be part of this community. Oh my gosh what an awesome group! Most of my favorite blogs are on this! Its so cool to see what everyone wants. I'd take anything on here too! Eeep, I love this soooo much!!! :-) I'm excited to visit the blogs I haven't yet and I'm excited for all of these gift ideas!! I would take everything on this list, first being the Keurig. :) I'm surprised no one mentioned a swanky calendar/planner. Everyone must be so organized =D thats what I would ask for. such a cute idea! i love everything on the list! Wow...I'll take one of each please! Especially that camera...drool! this sure is a great group! 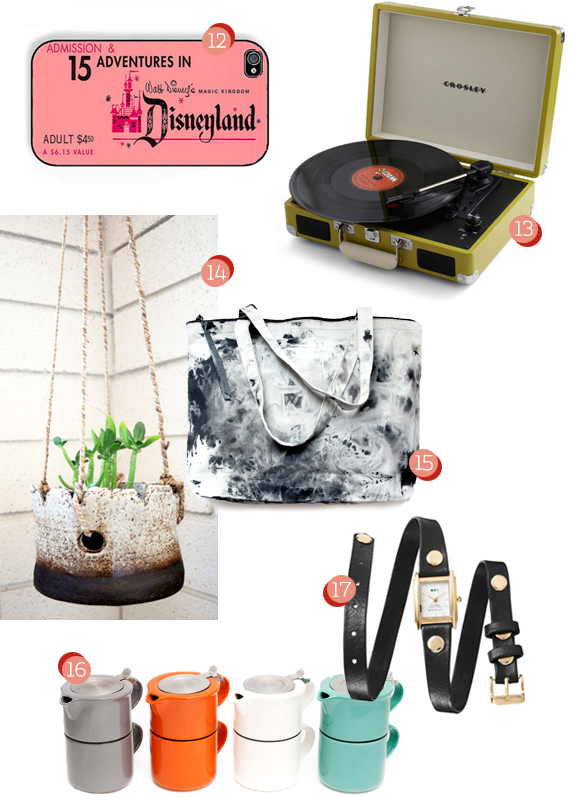 i love the west elm rug, the disney iphone case, the necklace and the watch. all of it actually! it's neat to see what everyone wants. ona's camera bag is on my wish list, too. oh, so many great ideas here. thanks for asking me to participate, melissa! This is such an incredible, original idea that was also executed brilliantly! how do I make a list like this, anyone? thank you so much for including me among such inspiring ladies! I've finished my shopping, but now I want to do more! In love with the number 1!!! I just love this style of purse! !